If we seem very quiet over the new year it is for a good reason, because we are enjoying the Christmas and New Years holidays and not being online at all! Rest assured we will be back in the new year as busy as ever, until then from the crew at Aussie RC, have a very merry Christmas, and a happy new year! We have talked about the fantastic Crowd Sourced Events Calendar for RC events on the RC tech thread, and the baton has been passed for 2015 to a new person running the thread, but as the commercials say, but wait, there’s more! I have not yet updated our page to those links, but I will do as soon as I have time in coming days. So if you love those big events, and who doesn’t, RC Race Dates Australia is the place to to to find them! 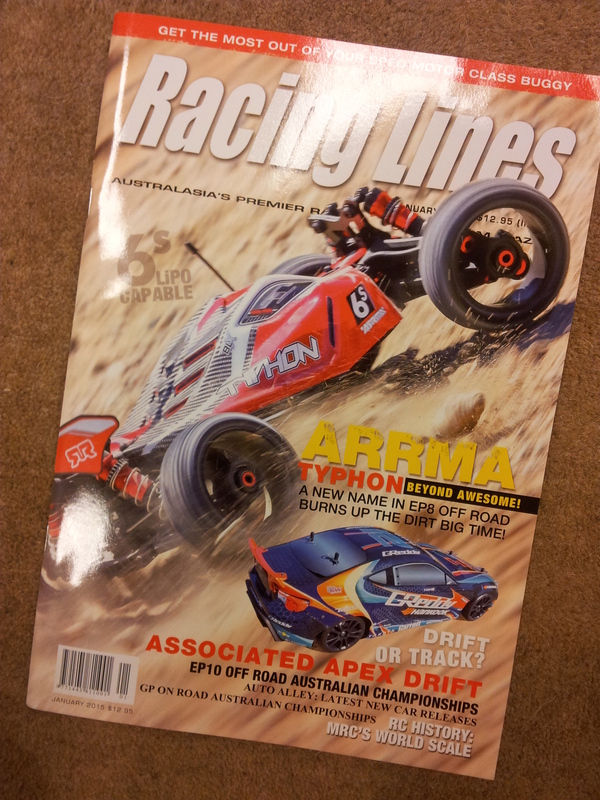 Racing Lines Issue 220 out now! Are you getting the battery that you paid for? It has been interesting seeing the capacity and C rating of Lipo batteries rise and rise of late, and I have always wondered how long that increase was sustainable on the currently available technology. Now it looks like SMC may have answered that for me! Superior Matching Concepts, or SMC, is a brand of battery that I was shown by then fellow racer Scott Guyatt as a good bang for your buck battery much akin to the Intellect batteries I am/was running at the time. I am afraid I am yet to buy any, but I am in need of some younger batteries so whey are moving up the list in priority and these are at the top of the list. However a post on their facebook page today caught my attention so I thought I would re-post it for our readers to see. The complete statement is included below. I’m making this post to try and help educate everyone about how crazy the Lipo ratings have become and are pretty much useless. I know most of you will appreciate this post and some will think I’m just using this to promote SMC but this is really to open some eyes. First let me explain the fact that their is no true C rate testing standards. Some factories use mAh retention and others use heat and voltage curve to determine the C rate. Every factory knows the C rate of their cells based on one of these 2 methods of C rate testing. When I started testing and buying Lipos 8 years ago the C rates were 10 to 20C for car packs. At that time the factories were giving true C rates based on their testing method for C rate. Within a few years C rates doubled but this was just marketing to try and sell more packs and make more money. Now 8 years later it’s even crazier with some outrageous C rate claims and mAh has also started to increase on the labels but not on the cells. In my opinion 80% or more of the packs being sold in car market today have a true C rate of 15 to 25C using the heat and voltage curve method for C rate testing. Using the mAh retention you can add 5C. There are some 30C and 35C packs available but these are very rare and cost more to make. C rate is the amp rate at which the cell/pack can be discharged at. So a 5000-20C can do 100amps. A 7200-20C can do 144 amps and so on. IR(Internal Resistance) is directly related to a cells ability to handle amp loads. So it’s not possible for a pack to have higher C rate and higher IR. This means a 7200-20C has to be lower in IR than a 5000-20C. The size of the cell also limits it’s mAh or C rate/IR. In car packs with hard cases we’re limited by the size of the case. This means if you want to increase mAh you must increase IR or vice versa. A 7200-25C will have higher IR than a 6000-35C. The 7200 will be able to do 180 amps and the 6000 will be able to do 210 amps. Only way the 6000 can provide more amps is to have lower IR. Now that we know this if true C ratings would exist the consumer/racer would be able to know what pack better suits his needs. Unfortunately this isn’t the case so there really is no way for the customer/racer to know. SMC is no different than others as we also use inflated C rates as we have no choice. If we would use true C rates we would be out of business. What we do try and do that is different is make sure that our ratings mean something. For example our 5000-40C will have higher IR than our 5000-50C and so on. Here is something that I find interesting and frustrating at the same time. Some of our competitors buying the same packs we do offer them with higher ratings. This leads to some customers buying these higher priced packs instead of ours. Here are 2 examples. The 4400-60C shorty which we sell for 29.95 is being offered as a 4600-90C at 44.95 and it’s the exact same pack that we offer. The 7200-60C-2S pack we offer for 39.95 is being offered as a 7600-75C for 64.95. Something else interesting is that a customer who bought one of our 5000-40C-2S packs at 24.95 compared it to a 5450-120C-2S pack at 129.99 and told me that our 40C pack ran longer and faster in the same vehicle and the 120C pack was new to make a fair comparison. Now that we know C rates are all made up and it’s actually getting a bit ridiculous to claim even higher C rates it seems like in the past few years mAh is now what is being inflated. Recently I tested a 7000-1S pack that only put out 6222mAh. I will admit some of our packs also have a bit lower mAh than claimed but this is due to the model being improved to provide lower IR. If you drop the IR the mAh drops. I hope this post can help some of you not fall for all the BS and hype and don’t be surprised if SMC starts releasing higher rated packs to try and keep up as it’s very frustrating to under rate our packs and lose sales. Another edition of this fabulous video series is available giving an insight into these big events, and what the drivers think of the event, controversies, track equipment and pretty much any topic of interest. Our own Kyle McBride event gets a little time on screen. 5150 Media Productions, together with Pro-LineRacing is proud to present the 2014 IFMAR Nitro Buggy World Championships! Held in the beautiful Mediterranean city of Giardini-Naxos Italy, these worlds did not disappoint. The track was challenging, the weather was ever changing & the competition was fierce. Take a behind the scenes look at what really goes on at a Nitro World Championship. Narrated by Mike Garrison, this “Come Drive With Us” Movie focuses on Lee Martin, Mike Truhe & once again, Ty Tessmann.